Fellow #BrewYorker Matt Steinberg, owner and founder of the New Jersey Beer Company, is finally releasing the fruits of his year-and-a-half long labor of beer-love to the public. A few select events and very lucky bars throughout NY and NJ have gotten their hands on casks of Matt’s brews. Needless to say, I was extremely jealous of the fortunate few who got to sample the very first sips of this highly-anticipated brew. So when Matt slipped me a Tweet saying a bar less than a mile from my house had got their hot little hands on a gravity cask of his 1787 Abbey Single Ale, I was counting the minutes to 5 o’clock to sprint downtown and add my name to that exclusive list. 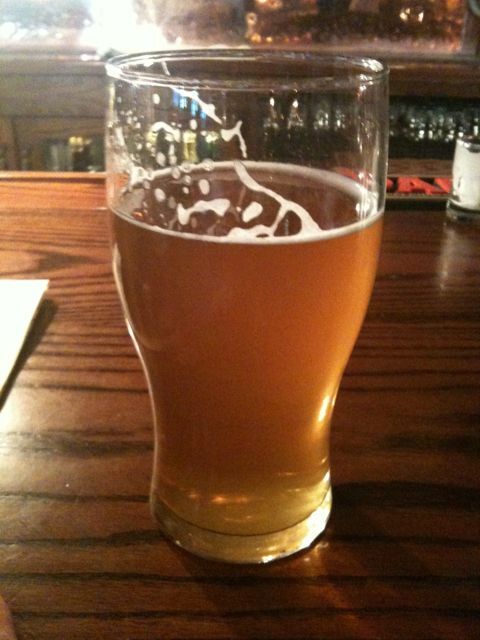 NJ Beer Co’s Abbey Single is a shining example of the best of the craft beer movement. You can taste the care and thoughtful crafting Matt put into this beer – from the subtle smell of clove, spice and yeast on the nose, through to the tad bit of hops you almost have to search for to find at the end. The nose is very subtle, with only hints of what I mention above. About a finger of light, white head sat on top of it. The first sip starts out sweet on the front of the tongue, just before the clove and spice from the yeast take over. They linger for a little while, then giving way to that slight hops bitterness just before the finish. This beer finishes as clean as the nose, with a little spice on the aftertaste. Overall, this beer is amazingly refreshing and dangerously sessionable. I had it on an 80 degree afternoon, and could see myself enjoying it long into the night. The cask conditioning really made this beer, and Matt’s decision to make the beer this way really shows his knowledge and love of brewing. He’s definitely got the craft brew spirit flowing in his veins and from his taps. While this beer isn’t the Applebees of beer, it should appeal to a lot of non-craft beer drinkers with it’s refreshing flavor and great drinkability. I’m looking forward to trying more of Matt’s offerings. Every weekend, I delight my desire for different by trying a few beers I’ve never had before. I’m hardly ever drinking the same thing twice. I usually just walk into the liquor store, wander back to the beer section, and take more time than any human should to make my selection. Thanks to a little inspiration from #BrewYork, I’m going to post my thoughts on these beers. I actually had this one chilling in my fridge for a few weeks when I picked it up from Ninety 9 Bottles down the road. I was saving it for a special occasion, and what more special of an occasion is there than Friday night. Warned by how highly carbonated this beer could be, I poured it slowly into a wine glass, which I thought was fitting after popping the cork on this beer. It poured a light, cloudy honey color, with a light white foam lacing on top. From what I heard about this beer, I thought the nose would be overwhelming, and I was surprised to find it wasn’t. I definitely got the bourbon on the nose, coupled with a strong alcohol presence. The first sip followed the nose, with lots of bourbon and alcohol, but not overwhelming with either. After a few more sips, I got more of the tripel ale flavor, which really helped balance things out. As the beer warmed up, I got a decidedly sweeter flavor, almost like honey from this beer. Needless to say, I really enjoyed this beer, as the tripel and the bourbon barrel aging really came together for a nice brew. Definitely the only beer I could handle in one night though, as the 11% caught up with me towards the end. This was based on another recommendation from Ninety 9 Bottles. Lagunitas always puts out quality beer, so I was definitely looking forward to this one. This beer poured a deep, dark brown into my pint glass with a nice head that retained for awhile. The nose of this beer was all about the coffee – but a sweeter coffee, kind of like the way I drink mine (lots of sugar). On my first sip, I got a lot of the coffee flavor and acidity upfront, mellowed out at the very end by the stout smoothness. I’m glad they chose a stout and not a ale style for the coffee addition, because that much bitterness may have rotten my teeth on the spot. The stout smoothness and roasted malts made themselves more prominent as the beer warmed up. I enjoyed this beer, and I could see it being a great mid-day brew if you’re looking to have just one. Since I moved to CT, I’ve been trying to get into the local beers in the area. I’ve gotten to know Captain Lawrence brews pretty well, and the New England Brewing Company (NEBC) is next on my list. It’s too bad they aren’t in South Norwalk anymore, because walking to a brewery could be a joyous and dangerous thing. NEBC is an early adopter of one of the latest trends in Craft Beer – canning. I can’t help but be on board given their rationale: they want to provide maximum protection for their beer from the harmful UV rays. Tugs at my home-brewing heart strings. I cracked one of these open on Saturday night, paired with some homemade Chipotle Roasted Pepper Chili. 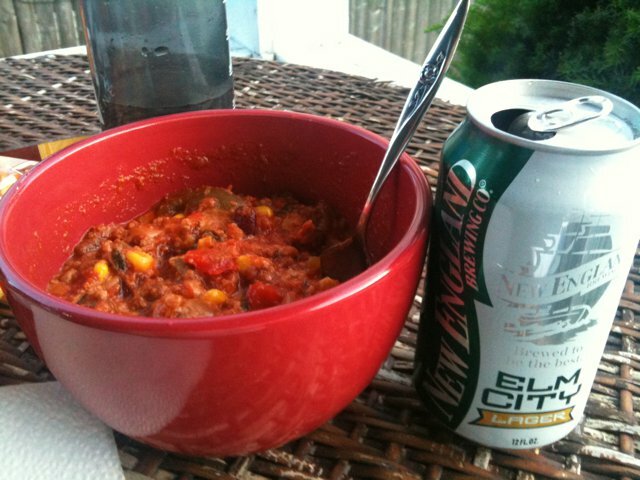 I need to write down this recipe, because this chili came out damn good, and I can’t want to make it again. Needless to say, my tastebuds were pretty shot when I was drinking this beer, so I can’t get into the subtleties of this beer. I did notice that it wasn’t a traditional lager, but a pilsner style, so the malt flavor was much lighter, and gave the hops a bit of a boost on the backend. (I might need to re-word the last part of that sentence.) This beer is extremely drinkable – very crisp and refreshing. It’d make a great 6 pack to drink while sitting out on the deck listening to the game on a warm summer night.